Two and a half years ago I planted four plants of kale in my garden for the first time. The first year the kale did very well and at the end of the season I just left it in the garden until the following spring when I planned on cleaning out the dead remains. To my surprise, even with a ton of snow and bitter cold temperatures, the kale plants all survived and all last spring, summer, and fall I was able to harvest kale from those same four plants. I attributed the kale’s survival to the fact that I hadn’t cleaned out any of the garden the kale was planted in and all the other dead foliage around the kale protected it from the weather. Last fall, when I’d finally harvested the last of the cucumbers, peas, and beans that surrounded the kale, I cleaned out the garden. I wanted to get a head start on the garden for 2016. After I was done, I surveyed my work and realized that the kale was still thriving. Deciding to harvest from it as long as I could, I figured when the snow and bitter temperatures hit, it would wither and die. How awesome is that! It’s the end of January and I’m still harvesting from the garden and I live in Michigan — this has got to be a record! Well, thanks to this wonderfully hearty plant, I was able to harvest some fresh kale yesterday and use it in my first attempt at Italian Wedding Soup. Check out the recipe at Simply Grateful Cooking – https://simplygratefulcooking.wordpress.com/2016/01/31/deluxe-italian-wedding-soup/. Boy this really gets me anxious for spring but even more excited for beginning the indoor planting which should be happening in just a month or so now, and for this I am — Simply Grateful. 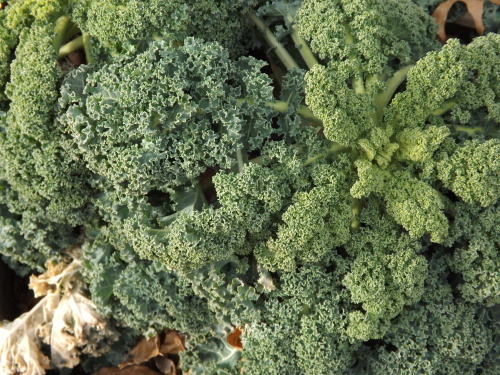 Categories: Kale | Tags: Gardening, Kale, Winter Harvest | Permalink.